One of the biggest buzzwords today is “Gamification.” Gamificiation is the application of game mechanics (i.e. leaderboards, awards, instant feedback, leveling systems, etc.) to every-day or mundane tasks. Gamification is often targeted specifically at tedious or unpleasant activities in an effort to make them more enjoyable. Chore Wars, a game which grants experience points and achievements for completing housework, is a perfect example of “gamifying” a task most people find undesirable. Another famous example of a gamified experience is FourSquare (now called Swarm), where you earn badges and rewards for “checking in” at different locations. The reward of stickers and badges encourage people to engage in an action (sharing their location, thus promoting that location) they may otherwise not engage in. For me, gamification is a dirty word. In theory, it’s a great idea. When playing a game, a person is intentionally putting obstacles between themselves and their goal. Overcoming those obstacles is part of what makes winning a game so enjoyable. Take soccer for example. The object of the game is to get more goals than the other team. But there are obstacles – no touching the ball with your hands, no tackling, offsides, etc. When we play a game, we collectively agree to overcome similar obstacles. 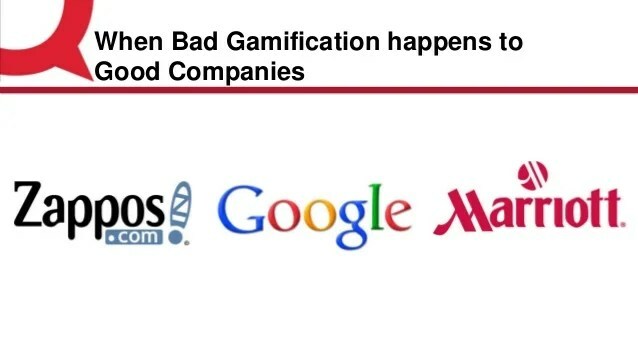 Gamification, while it can be effective, can also be destructive. Not everything can or should be gamified. Gamification gone wrong is an article unto itself, but here is a quick example of how creating competition by adding game elements can have disastrous effects. The tendency to package something as a game or simply slap on a few game mechanics is particularly problematic. For example, a colleague of mine worked in a neurorehabilitation clinic which used “video games” to help patients with brain injuries regain functioning. When used, the game demonstrated improved outcomes. However, no one wanted to play the game. When I asked her what the game was, she told me it was a matter of matching shapes, identifying symbols, remembering figures, and other incredibly boring tasks. Of course no one wanted to play it, it wasn’t really a game at all! Similar issues crop up in education quite frequently. The Edutainment business is booming, as evidenced by companies like LeapFrog. Unfortunately, most children quickly tire or shun these “games” because they are pushing the learning agenda rather than fostering learning through play. Take for example the classic computer game Oregon Trail. The goal of the game was to get your settlers from Missouri to Oregon country, and along the way you had to hunt, ford rivers, and avoid dying of dysentery. You started out by having to budget your money and make crucial decisions that would impact your survival on the trial. As you traveled, you saw the same great landmarks the travelers of the Oregon Trail saw – the Big Blue River and Independence Rock. The game was a huge success with children in multiple ways. The game was fun and challenging and engaging and because of these things, the player learns. We all know what happens if you start out with a team of horses rather than oxen and don’t buy a spare axel. We know this, not because it was the point of the game, but because it was a part of achieving the goal of getting to Oregon. In short, Oregon Trail taught information in context, in a systemic manner. With so much of education focused on recitation and memorization in order to produce standardized outcomes on standardized tests, meaningful learning through play is often sidelined. I recently read an article by MindShift entitled How Games Lead Kids to the Good Stuff: Understanding Context, and it is one of the best articles I’ve seen on the importance of play and context in learning. In contrast to memorization, drilling, and quizzing, which is often criticized because it focuses on facts in isolation, games force players to interact with problems in ways that take relationships into account. The content becomes useful insofar as it plays a part in a larger multi-modal system. Human being remember things in context better than in isolation. That’s why mnemonics like “My Very Energetic Mother Just Served Us Nine Pizzas*” are both popular and effective. It’s why we can remember the lyrics to a song we haven’t heard in years. So if you are trying to learn something yourself or trying to teach something to another, creating meaningful context is the gold standard. *Pluto will always be a planet to me. Subtle teaching is the best teaching, I was once told that you have to smack someone in the face for them to see the depth to it, I believe they have had bad experiences with people who are just defiant about learning.